My hands have been very dry, and cleaning Vasaras tack for hours in soap and water didn't help - my cuticles are broken and I couldn't leave them be. 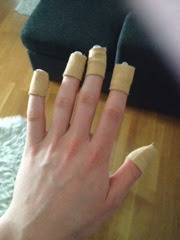 So - I had to bring out the antiseptic cream and lots of plaster and do an over-night wrap. It's a bit better today, thank god.